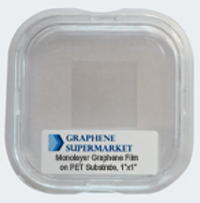 Monolayer Graphene on PET Size: 1"x 1"
Monolayer Graphene on PET, Size: 2"x2"
Please note that it is difficult to obtain a Raman spectrum of graphene film directly on PET due to a strong background signal. We can manufacture custom, large-size coatings, and use different shapes and types of plastic materials. 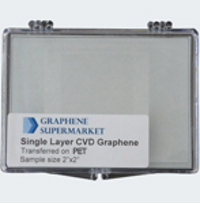 You may also send us your own substrates for coating. 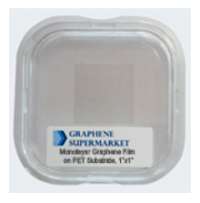 Few-layer graphene coatings with a lower sheet resistance and lower transparency can also be prepared. Please contact us for a quote.